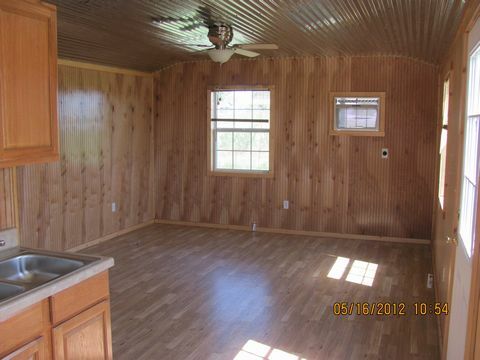 Are you interested in putting a prefab cabin on a plot of land in Arkansas? Deer Creek Structures specializes in building and delivering prefab cabins to those looking for the very best portable cabins on the market. Deer Creek Structures offers 12′, 14′, and 16′ width prefab cabins for residents of Arkansas and you are sure to be pleased with the high-quality of construction found with any cabin you select. 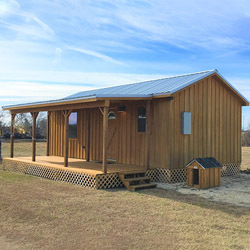 Call 254-546-2276 today to hear more about prefab cabins and other structures available for your Arkansas property and the many benefits that come with owning one. 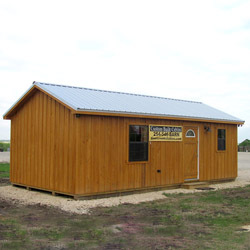 Deer Creek Structures offers quick delivery on a wide range of prefab cabins, barns and run-in sheds. Whats Your Prefab Cabin Made Of? 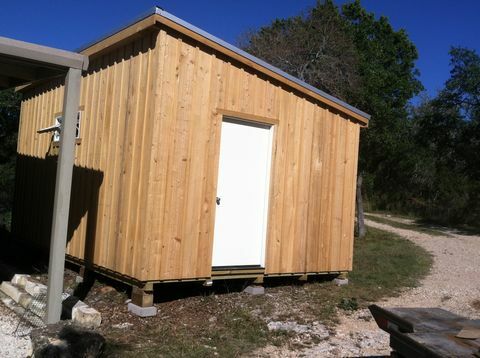 The prefab cabins provided by Deer Creek Structures are available both finished and unfinished. All of the prefab cabins delivered to Arkansas manufactured by Deer Creek Structures feature cypress siding on the exterior. Cypress wood is a superior product when it comes to exterior siding, offering a long-lasting and durable protection that can stand up to the elements. Cypress wood siding also acts as a natural insulator, which keeps portable cabins cool in the summer and warm in the winter. The prefab cabins also come with metal roofs that have low-E insulation that will suppress noise generated by the rain and keep your cabin further insulated. 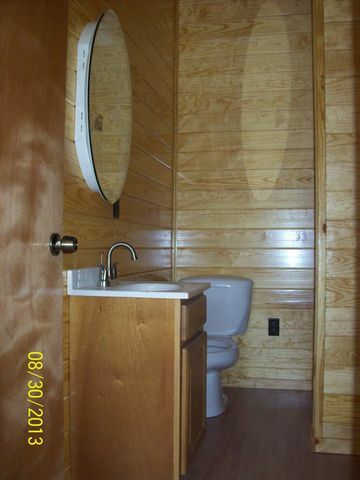 Prefab cabins in Arkansas can be used for a variety of different purposes. Some people use portable cabins for hunting or simply to provide a protected place to get out of the rain, wind or other weather elements during a hunting trip, ATV riding or horseback trip. Others prefer using prefab cabins in Arkansas to provide their families with additional living space, such as an in-law apartment or space for guests to stay the night. They can also serve as a resting place near a remote field or grazing area where you raise goats or sheep. 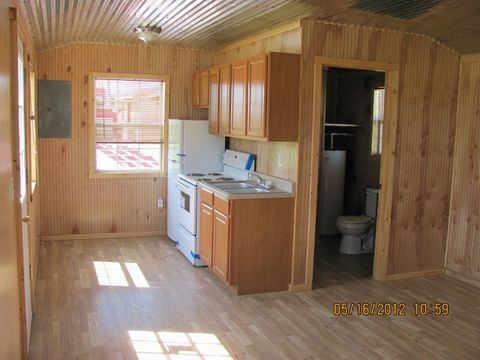 Whatever the reason, prefab cabins from Deer Creek Structures are an excellent option for those living in Arkansas. Get Info on our Prefab Cabins? 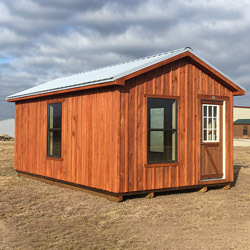 The 12-foot prefab cabins would be ideal for you.They are designed to give you just enough space to maneuver around when you are working on your land or enjoying a hunting trip. These prefab cabins are designed to provide you with extra space and storage, regardless of whether you plan to use it for relaxation or work-related purposes. You can add this next to your home or out in the middle of a field to provide simple protection from the elements and the extra space you need. Those looking for the largest prefab cabins in Arkansas will be delighted by the 16-foot portable cabin options. They can provide you with plenty of additional storage space or room to get work done, or serve as additional living quarters for your family. You will love the roominess of these prefab cabins.